Kevin Yazzie Arrows In Flight Sandcast Bracelet size 5 1/2"
Navajo silversmith Kevin Yazzie learned to make sandcast jewelry from renowned silversmith Aaron Anderson. He has been smithing silver for just a few years and shows great diligence, promise and commitment to his craft. 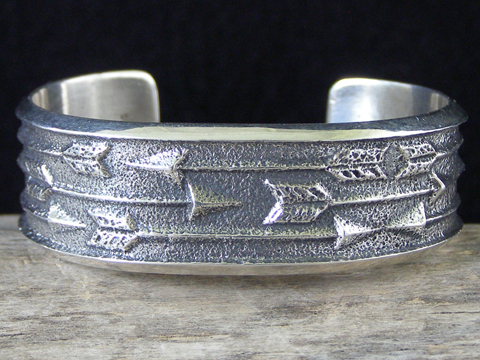 This stunning cuff is decorated with three rows of arrows in flight. He carved his mold so that there is a beveled lip on the edges of the cuff, which is a nice stylistic detail. He's employed the classic motif of the arrow in flight and rendered his design so that it shows his adeptness at carving in perfect symmetry, yet the design does not become sterile and repetitive. Superb! Made for a very, very small wrist. Hallmarked K and stamped Sterling inside. Terminal to terminal: 4 5/8"
Total inside circumference (including gap): 5 1/2"